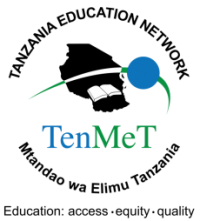 Tanzania Education Network/ Mtandao wa Elimu Tanzania (TEN/MET) is a national network of CSOs working in education. Founded in April 1999 by 39 Non-Governmental Organizations (NGOs).The network has around 181 members composed of Community Based Organizations (CBOs), Faith Based Organizations (FBOs), National and International Non‐Governmental Organizations (NGOs) and local networks. Its core aim is to coordinate and strengthen education Non-Governmental Organizations (NGOs), including international NGOs, to advocate for the equitable access to quality education and articulate concerns of local communities with an informed collective voice to influence policies for Universal Basic Education (UBE) in Tanzania. Coordinating and strengthening education Civil Society Organisations (CSOs) in Tanzania through networking, capacity building, research and advocacy. A national education system through which every Tanzanian child has the opportunity to engage in quality education core values. P.O.Box 13547, Dar Es Salaam.